There are some common virus that can spread and infect your computer through USB drives. These viruses include ‘Ravmon‘, ‘New Folder.exe‘, ‘Orkut is banned‘ and some other common viruses. Most antivirus either do not detect these viruses or do not remove them (just quarantine them). Here are the things to do if you want to remove these virus from your USB and want to have a virus free flash disk. - When you connect USB with your computer, you will get a window asking you what to do. Choose ‘Cancel‘ here. - Open command prompt by typing ‘cmd‘ in Run box (from Start > Run OR press WIN+R). In the command prompt, write ‘drive letter:‘ and press Enter (let us say your USB is E so you will write E:). - Now type ‘dir /w/a‘ and press Enter. - If any of the above file is there, that means USB is infected by viruses. - Type ‘attrib -r -a -s -h *. *‘ in command prompt and press Enter. This will remove the Read Only, Archive, System and hidden file attribute from all the files. - Now just delete the files using the command ‘del filename‘ (forexample, to delete a file with name abc.exe I will use ‘del abc.exe‘). - Your USB now does not have any suspicious file in it. To be on safe side you can now check it with any antivirus to see if it has any such file. - Now remove the drive and plug it again. Most probably the real culprit turns out to be the “Autorun.inf” which mostly gets executed on pressing OK in the dialogue window (the one shown above). Thus the virus can spread. 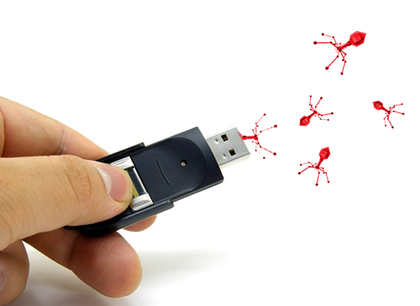 Disable the Autoplay feature of USB drives so that there are almost no chance of virus spread. 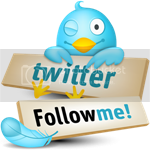 Tweak UI can do it for you, you can download Tweak UI software from here and install it. 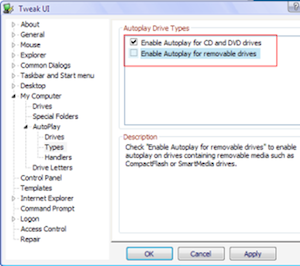 Run the program and disable the Autorun feature of USB drives as shown below.